This is the second installment of a position-by-position preview of the 2019 NFL draft. Today: Wide receivers. Wide receiver not only offers some of the better talent in the NFL draft, but it also has good depth. Although teams lately have avoided investing first-round picks in the position while finding stars – such as Stefon Diggs of Minnesota and Michael Thomas of New Orleans – later on, they’ll be tempted to grab some of this draft’s exceptional pass-catchers early. As many as five receivers could be selected in the first round or early in the second. Among the projected elite are D.K. Metcalf and A.J. Brown of Ole Miss, N’Keal Harry of Arizona State, Marquise Brown of Oklahoma and Kelvin Harmon of North Carolina State. It is reminiscent of 2015, when six receivers were chosen in Round One. “This is a markedly better and deeper group than last year's class,” NFL Media draft analyst Lance Zierlein wrote on NFL.com. In 2018, only two receivers were first-round choices: Maryland’s D.J. Moore and Alabama’s Calvin Ridley. Overall draft grade for the position: A. The Best: D.K. Metcalf, Ole Miss. He has everything a team could want from a top receiver: tremendous size (6-foot-3, 228 pounds), excellent speed, and superb athleticism. Scouts love his quick release, thanks to his ability to accelerate in a virtual blink, and the ease with which he separates when jammed. They also rave about the way he uses his big hands to grab the ball out of the air rather than relying on his body for assistance. Metcalf also gets high marks for being a highly effective blocker. Bills view: Receiver became significantly less of a need after the Bills made John Brown from the Baltimore Ravens and Cole Beasley from the Dallas Cowboys among their more prominent free-agent signings. Brown gives Josh Allen a speedy target to stretch the field. Beasley provides the dynamic slot receiver who can allow offensive coordinator Brian Daboll to incorporate more of the short and intermediate pass plays he used from the New England playbook from his days as a Patriots assistant coach. Zay Jones and Robert Foster figure to have the best chance to fill out the next two receiver roles. Another free-agent signee, Andre Roberts, has the inside track on the fifth spot because of his game-breaking return skills. Although the Bills probably will focus on both lines in the early going, a decent receiver should be available in the middle rounds. Nervous healthy eater: Hunter Renfrow couldn’t afford to be any smaller than the 5-10, 182 or so pounds he was during his final season at Clemson. Yet, he wound up dropping about 10 pounds before the Senior Bowl. “Nerves was a big part of it,” he explained to reporters at the NFL combine. 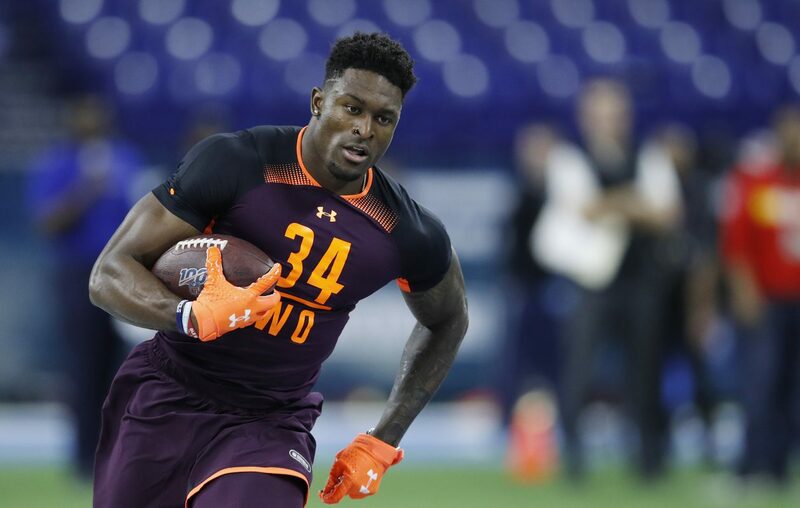 “I would try to eat more healthy, eat cleaner and I lost weight because of that before I started building back up through the training process.” He got up to 184 pounds at the combine. Scouts are quick to point to Renfrow’s small hands, short arms and that he doesn’t run very fast. But they can’t deny his overwhelming production as a slot receiver. He finished his college career with 186 receptions and 15 touchdowns. 1. D.K. Metcalf*, Ole Miss, 6-3, 228. Enormous skills and considerable physical gifts could very well make him a top-10 choice. 2. Marquise Brown*, Oklahoma, 5-9, 166. Exceptional speed makes him extremely difficult to cover one on one, and fearless attitude offsets his lack of size. 3. A.J. Brown*, Ole Miss, 6-4, 226. Not the most consistent performer, but when he’s dialed in, he can absolutely take over a game. 4. N’Keal Harry*, Arizona State, 6-2, 228. Runs excellent routes, blocks well, and should make his presence felt as a returner and on reverses and jet sweeps. 5. Kelvin Harmon*, N.C. State, 6-2, 221. Shows versatility to play inside and outside, and makes the most of his large catch radius. 6. Deebo Samuel, South Carolina, 5-11, 214. Thicker physique gives him more of a running back look, but shows good hands and consistently gets separation. 7. JJ Arcega-Whiteside, Stanford, 6-2, 225. Nice combination of size, strength and physicality, and even though he lacks great speed, he’ll make the difficult catch. 8. Parris Campbell, Ohio State, 5-11, 205. A high school running back, he shows considerable explosiveness after the catch and is impactful, particularly in space. 9. Hakeem Butler*, Iowa State, 6-5, 227. On the way to outstanding college career and graduation last December, has overcome adversity, including losing his mother to cancer when he was 12. 10. Riley Ridley*, Georgia, 6-1, 199. Not as productive as his older brother, Calvin, who the Atlanta Falcons made a first-round draft pick in 2018, but has the talent to eventually start.